Fearless counterterrorism operative Mitch Rapp finds himself directly in the line of fire in the latest riveting political thriller from New York Times bestselling author Vince Flynn. 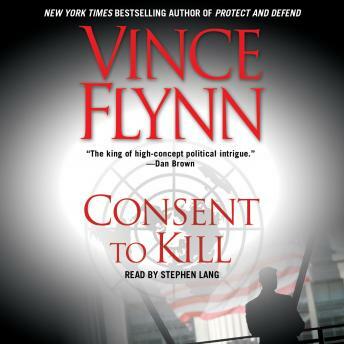 Consent to Kill takes listeners behind the headlines and catapults them to the front lines of the global war on terror. It sizzles 'with inside information, military muscle, and CIA secrets' (Dan Brown). Vince Flynn mixes military technology with his exclusive knowledge of Washington politics to create a hero that Americans will wish existed outside the realm of fiction. This guy is essentially Jack Bauer from 24! Enough said. Mitch is hands down one of my favorite characters to read about. Great book!! Captivating story, lots of action, Mitch Rapp is a such a great character. I’ll be looking for more books in this series. Narration was top notch. Excellent story line. Narration was very good. We thoroughly enjoyed listening to this in the car. The story line is good and the narrator engaging. I recommend this one. Fun read...way to go Mitch Rapp. Can't wait to read the next one. Edge of the seat intrigue, had to pull over a few times. I loved it!!!! I was surprised with the ending it made me cry! I am in love with a new author!!! !